StructureCast, an NPCA Certified Plant located in Bakersfield, CA, has carved a niche in the utility fence wall sector. 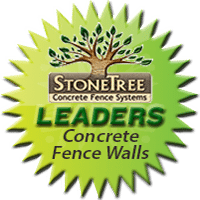 Under the guidance of Brent Dezember, StoneTree® Fence Walls with additional security equipment continue to be specified and installed throughout California. The company has completed nearly 20,000 feet of utility wall for Southern California Edison and Pacific Gas and Electric. With their persistent marketing efforts, StructureCast has had the StoneTree® System specified on additional projects and are in the completion stages of installing StoneTree® security walls in the Antelope Valley and Palm Springs areas of California, with two more projects following in the High Desert and Sacramento, which they plan to complete in the next two months. Randy Lofquist, Owner of Custom Fence and Supply, and the StoneTree® Manufacturer in Denver, CO, says “this year has been a great improvement over last and we are working on a lot of new opportunities.” Custom Fence is building a project using the StoneTree® brick texture, using multiple colors to create an “aged brick” look. They have also completed a large project for a Homeowner Association in Aurora. They are also preparing to build their first double stacked sound wall with security equipment for a Denver utility company which will be commencing construction in the next few weeks.